We know the elegant Phoenix, a sleek motorglider that also enjoys flying powered cross country flights (more on an especially long flight in another video). At Aero 2013 we had a chance to visit with Martin Stepanek about Phoenix Air's pure-electric aircraft called the ePhoenix. Martin helps us understand the details of electric power in a modern, efficient Light-Sport Aircraft. We know the elegant Phoenix, a sleek motorglider that also enjoys flying powered cross country flights (more on an especially long flight in another video). At Aero 2013 we had a chance to visit with Martin Stepanek about Phoenix Air’s pure-electric aircraft called the ePhoenix. Martin helps us understand the details of electric power in a modern, efficient Light-Sport Aircraft. Read More About: Phoenix Phoenix Air s.r.o. If you love long, shapely wings, here's an airplane to warm your heart. But it's more than an LSA airplane... in fact, it's a motorglider and a most impressive one at that. For soaring enthusiasts Phoenix is one of the most attractive choices among all Light-Sport Aircraft. But it can cruise fast and long while providing a huge safety measure of a very long glide in the unlikely event her engine should fail. See standard multiple wings and more in our video presentation of Phoenix. If you love long, shapely wings, here’s an airplane to warm your heart. But it’s more than an LSA airplane… in fact, it’s a motorglider and a most impressive one at that. For soaring enthusiasts Phoenix is one of the most attractive choices among all Light-Sport Aircraft. But it can cruise fast and long while providing a huge safety measure of a very long glide in the unlikely event her engine should fail. See standard multiple wings and more in our video presentation of Phoenix. With Aero mere days away now, excitement is growing for the electric aircraft event-within-the-event. Visitors can tour around the entry foyer hall where the e-flight-expo will be located. This year offers a few highlights, provided to me from my publisher friend Willi Tacke in Germany. One aircraft not many Europeans and even fewer Americans have seen is the Chinese RX1E made by the Liaoning Ruixiang General Aircraft Manufacturing Company. An electric motorglider, RX1E earned its CAAC Type Design Approval (TDA) earlier this year using ASTM standards (article). Willi reported, "The Chinese team lead by chief developer Professor Dr. Yang Fengtian is now seeking certification in other countries such as Germany or France. Some companies will not be attending not because their projects have stopped but because they are at critical junctions. Among those missing will be the Volocopter from e-Volo nor any man-carrying aircraft display by Yuneec — which last year showed their eSpyder that had just won German approval. However, the company will be present with their drone/UAV models and their electric powered skateboards, the latter seen at AirVenture 2013. Martin Stepanek from the Czech company Phoenix will show his electric powered Phoenix motorglider. This lovely aircraft has been sold successfully in the USA by Jim Lee but we have not seen the electric version on this side of the Atlantic. Fortunately, you can catch our video on it. 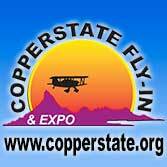 Willi wrote, "A newcomer at the e-flight-expo is Chip Erwin from Florida. His company Aeromarine-LSA has developed a new light electric drive with a new brushless motor. He uses this device to power the Italian tube and fabric ultralight, Zigolo." Chip told Willi that his new motor weigh 6 kilos (13 pounds) and has up to 30 kW (40 horsepower). That ought to make this super lightweight aircraft perform amazingly well. "The global market leader of gyrocopters, AutoGyro, will show, like last year, its joint venture with Bosch General Aviation," reported Willi. "This project is supported by the EU and shall research if and how e-motorization will be possible for gyros with their higher need of power compared to fixed wing planes." Bosch is adapting components for aviation that were previously used in automobiles. See our AutoGyro Video Pilot Report here. The biggest news in this category is the aviation market entry by a megacorporation, Siemens (2014 revenue: $98 billion). "Siemens is choosing a different way to enter, compared to Bosch," wrote Willi. "In 2011 Siemens started a program to become a supplier of motors, because the company is confident of a future market for hybrid electric motor devices for planes with two to 100 seats. 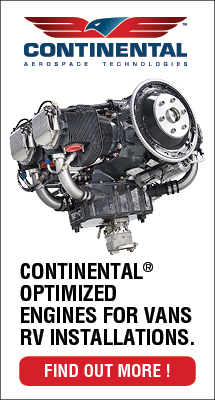 A Siemens division based in Erlangen, Germany has been working with miscellaneous aviation manufacturers of general aviation aircraft and airliners, for example such companies as Pipistrel and Boeing." At Aero, Siemens will show a much more powerful electric motor. 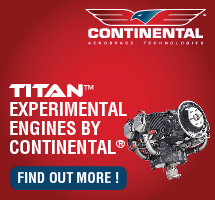 The company has been testing a 261 kW or 255 continuous horsepower motor that weighs only 50 kilograms (110 pounds). "We will put this motor in the air this year," promised Frank Anton, who is head of aviation development at Siemens and is also responsible for other electric drive systems especially for railways. Siemens is focused not only on the motor but on the full propulsion system: motor, hybrid combustion motor, generator, batteries, and the controls. 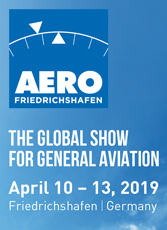 Aero has become known to many of us who make the annual pilgrimage as a place where you can find interesting ideas that are not commonly seen at American airshows. The e-flight-expo will be a key element of this but I will attempt to keep readers aware of other interesting developments. 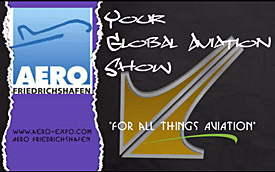 Join me as I report from Aero 2015 next week. With Aero mere days away now, excitement is growing for the electric aircraft event-within-the-event. Visitors can tour around the entry foyer hall where the e-flight-expo will be located. This year offers a few highlights, provided to me from my publisher friend Willi Tacke in Germany. One aircraft not many Europeans and even fewer Americans have seen is the Chinese RX1E made by the Liaoning Ruixiang General Aircraft Manufacturing Company. 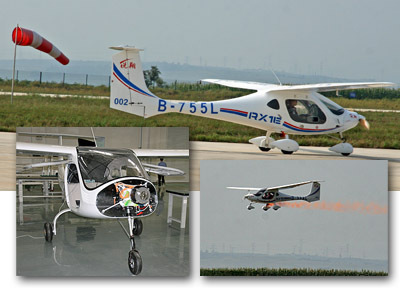 An electric motorglider, RX1E earned its CAAC Type Design Approval (TDA) earlier this year using ASTM standards (article). Willi reported, “The Chinese team lead by chief developer Professor Dr. Yang Fengtian is now seeking certification in other countries such as Germany or France. Some companies will not be attending not because their projects have stopped but because they are at critical junctions. Among those missing will be the Volocopter from e-Volo nor any man-carrying aircraft display by Yuneec — which last year showed their eSpyder that had just won German approval. I think Phoenix is one the loveliest aircraft in the LSA fleet. Of course, I have a rather large bias as I'm a soaring enthusiast and this is one fine soaring machine in the SLSA fleet, able to compete fairly with a pure glider. I'm also a fan of importer Jim Lee, a modest, soft spoken man with a deep honesty streak. He's also a world-renown soaring champion. Yet what just catches my eye again and again are the long, lovely, shapely, slippery wings of Phoenix, which lead me to present the photos you see with this article. 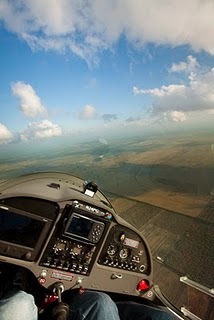 These views came from Jim's long flight from his home base not far from mine in Melbourne, Florida to Bogota, Columbia. That meant a long water crossing from Key West to the Mexican coast, then south to Belize and on around to his destination (see route map). Jim wrote a blog of this entire experience featuring many photos and I'll bet most pilots would like to read it. You may never attempt such a long flight over such demanding terrain — immense stretches of water, tall mountains, and dense forests — but you can fly vicariously with Jim through his portrayal. You may not think of yourself as a soaring pilot so perhaps a SLSA like Phoenix does not initially appeal to you even while you cannot deny its beauty and the efficiency of its design plus a cockpit comfortable enough for such a long voyage. However, plenty of others see Phoenix's capability. 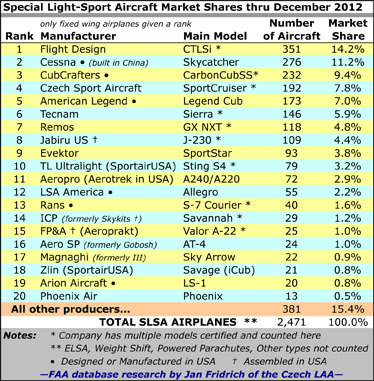 Importer Phoenix Air USA came in tied for an impressive sixth among all SLSA for registrations in 2012. For a specialty, niche aircraft, that is a great credit to both the aircraft and Jim's gentle but persuasive selling methods. His success means that if you want one, you'll need to plan on a wait. It won't take anywhere near as long as a new Ferrari, but you'll have to be patient. The good news is the reward at the other end puts big smiles on the faces of new owners. During the wait, Jim is lauded for providing information about the process from the Czech builder. Interested in more info about the aircraft used for this long flight? Here are some teasers: • glide 32:1 • power cruise 115 knots • stall 38 knots • useful load 612 pounds • range 900 nm (power on). For those unfamiliar with glide angle performance, get this: Phoenix can glide, engine off, for more than 30 miles from only 5,000 feet above the surface. For its base price buyers receive wing extensions that give Phoenix two distinct (yet pleasant) personalities. Via the two wing configurations, a 49 foot motorglider wing reduces to just 36 feet with the insertion of different wing outer sections. When luxuriously outfitted with an EFIS, autopilot, airframe parachute, radios, and transponder, Phoenix is one of the higher priced Light-Sport Aircraft but compared to "full-sized" motorgliders Phoenix's price tag is actually modest. You can read more in this earlier article or this one or watch our video. You can also read fellow blogger Jim Lawrence's view (with this disclaimer: like me, Jim is a soaring enthusiast so we are both quite taken with Phoenix). Even if you are not excited by flying engine off, keep in mind Phoenix's great performance in glide and its superb efficiency combined with surprising speed. For the 2,211 nautical mile delivery flight to Bogota, Phoenix flew 20.6 hours for an average speed of 110 knots. Sweet! I think Phoenix is one the loveliest aircraft in the LSA fleet. Of course, I have a rather large bias as I’m a soaring enthusiast and this is one fine soaring machine in the SLSA fleet, able to compete fairly with a pure glider. I’m also a fan of importer Jim Lee, a modest, soft spoken man with a deep honesty streak. He’s also a world-renown soaring champion. Yet what just catches my eye again and again are the long, lovely, shapely, slippery wings of Phoenix, which lead me to present the photos you see with this article. These views came from Jim’s long flight from his home base not far from mine in Melbourne, Florida to Bogota, Columbia. That meant a long water crossing from Key West to the Mexican coast, then south to Belize and on around to his destination (see route map). Jim wrote a blog of this entire experience featuring many photos and I’ll bet most pilots would like to read it. Green Flight Challenge Down to Final Three! 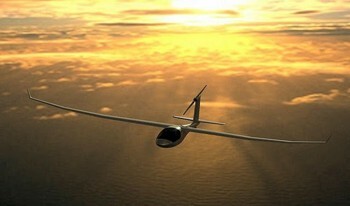 Updates 10/4/11 and 10/5/11 — Congratulations to Pipistrel for their unprecedented third win at a NASA Challenge. Picking up a cool $1.35 million, the company won with their unorthodox dual Taurus G2 fuselages joined by a larger, centrally-mounted electric engine. The custom-configured, four-seat aircraft achieved an amazing 403 passenger miles per gallon of fuel (or its equivalent). After this string of wins, Pipistrel has firmly placed itself in the lead position among highly efficient light aircraft and those powered with electric motors. *** NASA claims the prize purse was the biggest ever awarded for an aviation competition. In second-place a much smaller but still hefty check for $120,000 went to the German eGenius team, NASA announced. 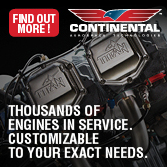 *** Read more from our friends at AvWeb and at Flying online. In addition, Aero-News offers a video with more on the potential of electric power (scroll to or search for "The Green Flight Challenge"). —DJ The CAFE Green Flight Challenge is at last underway — it was originally planned for mid-July — and as of the end of today's flying, just three of the original 13 entrants are still qualified to keep going for the $1.65 million prize money. *** The event, centered in Santa Rosa, California (between Los Angeles and San Francisco), is sponsored by Google and is seeking to advance public awareness and the technologies of electric and high-efficiency flight. Electric-driven aircraft have garnered most of the advance press, though most of the electric entrants have either been eliminated or couldn't get their aircraft ready in time.It's a pretty simple task: fly 200 miles averaging 100 mph or greater... with one teeny tiny hitch: fuel burn or fuel equivalent use (electric or electric/hybrid) can only be one gallon of fuel. That's right: one (1) gallon. Put another way, that's 200 mpg. Daunting, to say the least. *** Every task day there are different challenges to test the full mettle of each aircraft and pilot, such as a strictly economy run, a maximum decibel test, then the final speed/economy run on the last day. *** One entry, the Eco-Eagle, in the works for 2 years from Embry-Riddle Aviation University, was just disqualified because the race rules specify a two-place airplane must fly with two people, not just a pilot and an equivalent copilot weight in the other seat. But Embry-Riddle's rules specify only one ERAU participant can fly in a competition event. The Eco-Eagle also did not have a fully functioning airframe parachute system, although one was aboard, and that violated another CAFE requirement. *** The officials, with full consent of the other competitors, will allow the aircraft to fly in the race as a demonstration aircraft, and although it's not eligible for an award, it will be interesting to see how it fares against the others. *** Gotta say, somebody didn't do their homework. Those poor kids at Embry Riddle worked for two years and nobody figured out they wouldn't be legal because of a basic rule: flying with all seats filled? Hard to figure that one, but kudos to the team and the competitors for encouraging the ERAU team to be part of the event: they've certainly earned it. The aircraft was performing very well in practice runs according to varied reports from the field. *** In a bit of a surprise, old friend Jim Lee in the Rotax-powered Phoenix USA is one of the three remaining competitors (along with Pipistrel's Taurus G4 and Germany's e-Genius)! Jim's a master at squeezing every last bit of performance out of whatever he flies (as I've written before, he held the distance hang glider record for years back in the '80s and is an accomplished sailplane pilot). And he really loves nibbling the thermal potential in his elegant, high tech Phoenix motorglider, for which he's also the U.S. distributor. *** Ah, my misspent youth: if only I could afford one... or a Pipistrel Vinus or Sinus... or Eric Raymond's Sunseeker... alright kid, snap out of it. *** I don't know yet what happened to the electric version, the PhoEnix, other than it couldn't be made ready for race date in time or perhaps wasn't performing up to expectations. *** Many people are reporting that it's the electric version that's flying, but Jim's comments in the video below would seem to put the kibosh on that. Too bad PhoEnix is out, it was a promising entry... but also kind of cool that a gas-powered motorglider is even in the finals. Good hunting Jimbo! *** Having the stock 100 hp Rotax-powered Phoenix in the final running should be a great PR boost too for what is already the sweetheart motorglider of the LSA genre. Motorgliders are gaining more attention from pilots who want more than point A to point B flying on their plates. *** One of the other two remaining entrants is the Pipistrel Taurus G4 (this link goes to Pipistrel's Michael Coates's gallery of GFC photos, worthy of a look). 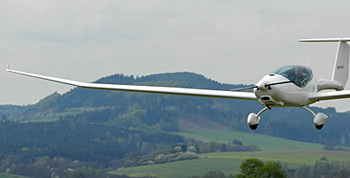 The G4 is in essence a purpose-built joining of two Taurus G2 electric motorglider fuselages onto a larger wing with an electric powered motor-only pod at wing center — a wild jump of ingenuity because being able to carry four passengers, two in each pod, (which CAFE rules require them to do) does qualify the aircraft to carry the equivalent of four gallons of gasoline in electric power storage capacity — one gallon per person is the rule, for 200 miles at 100 mph. The G4 may turn out to be a winning strategy, if the economy is there.The final entrant is e-Genius, built by University of Stuttgart aeronautical engineers and students and a formidable entry in its own right. *** Today's event required all entrants to meet the noise level ceiling of 78 dBA during full-power takeoff, as measured from 250 feet away. All three (four counting the non prize- qualified Eco-Eagle) met the challenge. 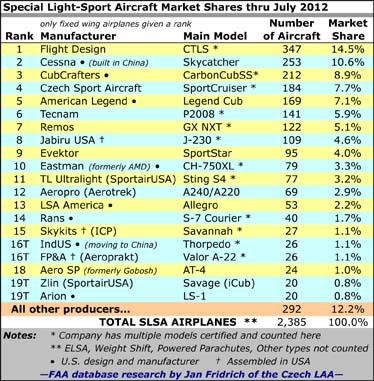 Updates 10/4/11 and 10/5/11 — Congratulations to Pipistrel for their unprecedented third win at a NASA Challenge. Picking up a cool $1.35 million, the company won with their unorthodox dual Taurus G2 fuselages joined by a larger, centrally-mounted electric engine. The custom-configured, four-seat aircraft achieved an amazing 403 passenger miles per gallon of fuel (or its equivalent). After this string of wins, Pipistrel has firmly placed itself in the lead position among highly efficient light aircraft and those powered with electric motors. *** NASA claims the prize purse was the biggest ever awarded for an aviation competition. In second-place a much smaller but still hefty check for $120,000 went to the German eGenius team, NASA announced. 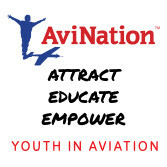 *** Read more from our friends at AvWeb and at Flying online. In addition, Aero-News offers a video with more on the potential of electric power (scroll to or search for “The Green Flight Challenge”). "...through footless halls of air..."
Ready for sky: Phoenix with the long wing extensions. Wonderful aerodynamic lines and just plain beautiful. Nothing like getting some air. *** Thanks to Jim Lee of Phoenix Air USA, I finally had my desire: Jim and I flew the fabulous new Phoenix LSA motorglider, with both wingtips (max span: 49 feet!) out of his home base at Melbourne International Airport, Florida, and I have to say simply this: it cured my winter blues.Or to paraphrase Renée Zellwegger, "Shut up. Just shut up. You had me at liftoff." *** To say the Phoenix lives up to its advance billing is understatement, plain and simple: it's a wonderful airplane for anybody who desires to have friendly Light-Sport handling (2 second roll rate, 45° to 45°), wonderful engine-off soaring performance (200 fpm sink rate), excellent and comfortable XC cruise (100 knots at 75%), comfortable, semi-reclined seats, great visibility with the sleek bubble canopy and forward rake of the cowl, beautiful lines, wonderful engine package... need I go on?I'll let the pix do the talking for now. Expect my flight report in Plane & Pilot magazine soon. 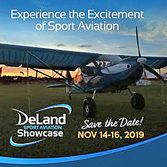 *** Tomorrow... Sebring 2011 Light-Sport Expo! *** Stay tuned for my daily reports. The rumors be flyin' about lots of exciting new developments in what we all hope is a move-up year for the economy, and the aviation industry. Nothing like getting some air. *** Thanks to Jim Lee of Phoenix Air USA, I finally had my desire: Jim and I flew the fabulous new Phoenix LSA motorglider, with both wingtips (max span: 49 feet!) out of his home base at Melbourne International Airport, Florida, and I have to say simply this: it cured my winter blues.Or to paraphrase Renée Zellwegger, “Shut up. Just shut up. You had me at liftoff.” *** To say the Phoenix lives up to its advance billing is understatement, plain and simple: it’s a wonderful airplane for anybody who desires to have friendly Light-Sport handling (2 second roll rate, 45° to 45°), wonderful engine-off soaring performance (200 fpm sink rate), excellent and comfortable XC cruise (100 knots at 75%), comfortable, semi-reclined seats, great visibility with the sleek bubble canopy and forward rake of the cowl, beautiful lines, wonderful engine package… need I go on?I’ll let the pix do the talking for now. Jim Lee kindly brought his stunning Phoenix to my new home at Spruce Creek Fly-in. Long 49-foot wings help Phoenix glide 30 miles on only 5,000 feet of altitude. Yes, the prop is stopped... and can be feathered for lower drag. With the sunset glowing on her wings, Phoenix reveals a motorglider's smooth, complex curves. Yesterday, I was again grateful for my residence at Spruce Creek Fly-In, the large airport community near Daytona Beach, Florida. Why? Because after a lucky last-minute phone call, I zipped over to the airport restaurant and went flying with Jim Lee in his new Phoenix. 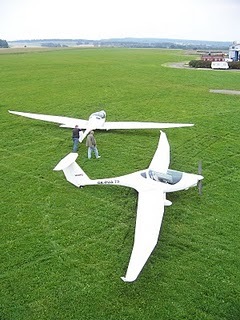 *** Now, I'm a soaring enthusiast, so a LSA motorglider already starts well up my wish list. But this Phoenix, whew! She's simply gorgeous with slippery compound curves and the handling is marvelous. *** Much more than simply a soaring machine, Phoenix climbs like the proverbial homesick angel and can cruise faster than many LSA. It also comes standard with two wing configurations — 49 feet stepping down to 36 feet — so you really get two airplanes in one. (Not only that, but if you need to put Phoenix in a hangar, you can remove the long wingtips to squeeze down to a 34-foot span, hardly any wider than a "standard" LSA.) *** Inside the cockpit, the 43-inch wide space is handsomely appointed and you have a few controls and an instrument not typically found in LSA. You have some prop controls — get the full LSA Glider explanation to understand how this works. 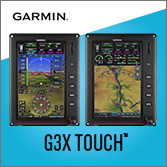 Plus any self-respecting soaring pilot wants a variometer to find lift; Phoenix provides this with a small instrument that also makes sounds that allow you to keep your eyes outside the cockpit. *** You'll want to pore over the specifications and I've only given a brief review here. I hope to fly Phoenix again soon when we can explore soaring conditions. But here's a few tidbits: • glide 32:1 • power cruise 115 knots • stall 38 knots • useful load 612 pounds • range 900 nm (power on). *** Phoenix isn't cheap, but you get a lot for the money. Base price is presently $149,000 including those wing extensions that give Phoenix two distinct (yet pleasant) personalities. When luxuriously outfitted with a highly readable EFIS, autopilot, airframe parachute, radios and transponder, Phoenix can hit $165,000. Those who have investigated motorgliders will see this as modestly priced. You don't get these lines and this kind of performance for a bottom-dollar price. She's a specialty aircraft but since Lamabada left the scene, Phoenix occupies this special space all by her lonesome. Jim has a long list of good prospects so I wouldn't wait too long to check out this Czech beauty. I know I'm in love; my attempt at photos doesn't do her justice. Yesterday, I was again grateful for my residence at Spruce Creek Fly-In, the large airport community near Daytona Beach, Florida. Why? Because after a lucky last-minute phone call, I zipped over to the airport restaurant and went flying with Jim Lee in his new Phoenix. 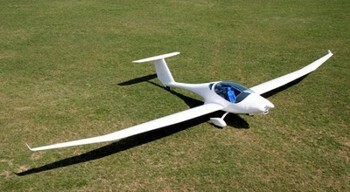 *** Now, I’m a soaring enthusiast, so a LSA motorglider already starts well up my wish list. But this Phoenix, whew! She’s simply gorgeous with slippery compound curves and the handling is marvelous. *** Much more than simply a soaring machine, Phoenix climbs like the proverbial homesick angel and can cruise faster than many LSA. It also comes standard with two wing configurations — 49 feet stepping down to 36 feet — so you really get two airplanes in one. (Not only that, but if you need to put Phoenix in a hangar, you can remove the long wingtips to squeeze down to a 34-foot span, hardly any wider than a “standard” LSA.) *** Inside the cockpit, the 43-inch wide space is handsomely appointed and you have a few controls and an instrument not typically found in LSA. Looking out the window at falling snow (and it's only November 8th... Bah! ), back from a two week vacation to Europe and Turkey, and mired in writing a big LSA buyer's guide for Plane & Pilot mag, I've only got a few minutes to splash up some photos of what to me is a big event: the ASTM certification as an SLSA of the Phoenix motorglider! *** See Dan Johnson's post below where you can follow his links to Jim Lee's sites for more info on the exciting news we've been waiting for some time to hear. *** The Phoenix is the more-than-worthy "sequel" [by another, unrelated company] to the Lambada SLSA motorglider that turned a lot of pilots on (including me and Dan). When two breakups last year clouded its future, a lot of us were glad to hear from Jim that the Phoenix was waiting in the wings to take its place. *** So congratulations Jim, glad to see it's a happening thing. *** He just completed a recent cross country trip and posted some beautiful shots on the soaring and motoring high above my old stompin' grounds in the Sierra Nevada Range of California... read all about it for an up close and personal account on Jim's blog. *** And even if you're in a better clime than I, don't feel bad about my snowboundedness. I'll be in sunny Florida in January hoping to fly the gorgeous Phoenix at the Sebring Sport Aviation Expo. *** Mark your calendars and start searching for accommodations: it's Jan. 20-23, 2011. Looking out the window at falling snow (and it’s only November 8th… Bah! ), back from a two week vacation to Europe and Turkey, and mired in writing a big LSA buyer’s guide for Plane & Pilot mag, I’ve only got a few minutes to splash up some photos of what to me is a big event: the ASTM certification as an SLSA of the Phoenix motorglider! *** See Dan Johnson’s post below where you can follow his links to Jim Lee’s sites for more info on the exciting news we’ve been waiting for some time to hear. *** The Phoenix is the more-than-worthy “sequel” [by another, unrelated company] to the Lambada SLSA motorglider that turned a lot of pilots on (including me and Dan). When two breakups last year clouded its future, a lot of us were glad to hear from Jim that the Phoenix was waiting in the wings to take its place. I've had the pleasure to fly more than 350 light airplanes of every conceivable description. Most of those experiences brought a smile to my face. A few genuinely stirred my soul. Though I started in powered aircraft I found my way to gliders and to soaring, which I freely admit is my favorite aviation challenge. To rise high above the Earth using only swirling currents of air is magical. *** An extra benefit was acquiring confidence about landing without an engine. To many power pilots, an engine-out landing is scary. But every landing in a glider involves but one approach. You know what? You get comfortable with it and now when I fly a power plane, I don't worry as much about a loss of power. My power plane will just become a glider and I know how to handle that. *** So with great anticipation over an eventual test flight, I am delighted to announce the Phoenix was certified as SLSA #111 in August 2010. 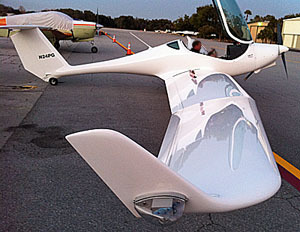 Immediately afterward, U.S. importer Jim Lee of Phoenix Air USA flew the slender winged bird from California to Florida! Check out his travel blog; it's written in a brief, enjoyable style with some terrific photos. *** Offering a few tidbits before a full pilot report to follow... Phoenix has full span flaperons that operate on lovely, compound angle wings that end in tasteful winglets. She's a picture of grace. Phoenix can also swap wings. Jim reported, "It takes about a minute to remove both [span extending] wingtips, and another minute to install the short tips." Check these install images. A center console houses the flap, airbrake, and trim with separate levers for the spoilers and flaps so that they can be used independently. *** Specs: span 49.4 feet (can be reduced to a 34 foot "hangar span" in 60 seconds); glide angle 32:1; cruise with full-span wings, 120 mph; cruise with shorter wings, up to 136 mph; useful load 612 pounds and 456 pound payload; climb 1,200 fpm. 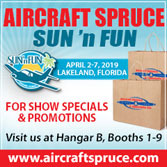 *** The first airshow debut of Phoenix will be at Sebring 2011. Here's one worthy of a close examination. I’ve had the pleasure to fly more than 350 light airplanes of every conceivable description. Most of those experiences brought a smile to my face. A few genuinely stirred my soul. Though I started in powered aircraft I found my way to gliders and to soaring, which I freely admit is my favorite aviation challenge. To rise high above the Earth using only swirling currents of air is magical. *** An extra benefit was acquiring confidence about landing without an engine. To many power pilots, an engine-out landing is scary. But every landing in a glider involves but one approach. You know what? You get comfortable with it and now when I fly a power plane, I don’t worry as much about a loss of power. My power plane will just become a glider and I know how to handle that. *** So with great anticipation over an eventual test flight, I am delighted to announce the Phoenix was certified as SLSA #111 in August 2010. Phoenix Rising: The Next Big Thing? Caught up with Jim Lee recently to find out what’s up with the Phoenix motorglider I wrote about here a few weeks back. 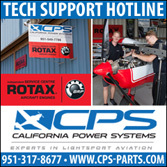 *** The good news is his full time devotion to making Phoenix the Next Big Thing in LSA motorized soaring flight. He’s renamed his Urban Air company Phoenix Air USA. *** Believe me, if you haven’t tried a motorglider, you’re missing one of aviation’s greatest experiences. *** Imagine cruising along as fast as 115 knots on a thermally active afternoon. Up ahead, a big, white cumie cloud with a flat, gray bottom presents an irrestible invitation. *** Here’s where the fun starts: as you get closer, you turn off the engine, feather the prop, trim up for minimum sink, and start looking for the lift under the cloud. In a minute or two your search is rewarded with a good, strong push under the left wing – That’s lift calling your name! Whoopsie. In my last post on the Phoenix motorglider, I had some incorrect info that Jim Lee set me right on, so here's the skinny. *** Urban Air USA, which Jim represented and which imported and marketed the Lambada motorglider is being purchased, he said, "with plans to return the Samba XXL (composite low wing SLSA) and Lambada (SLSA motorglider) to production." *** Jim also notes Phoenix Air S.R.O. and his Lee Aviation LLC, dba Phoenix Air USA, are completely different companies with no relationship to Urban Air. *** Also, I'd mentioned Evektor's new direct-sale program, but Mr. Lee also noted that Evektor is still working out the details and may not do direct sale ops but some other program instead. *** I've got queries into the Czech company and will update once I hear. *** Thanks for the clarifications, Jim! Whoopsie. In my last post on the Phoenix motorglider, I had some incorrect info that Jim Lee set me right on, so here’s the skinny. *** Urban Air USA, which Jim represented and which imported and marketed the Lambada motorglider is being purchased, he said, “with plans to return the Samba XXL (composite low wing SLSA) and Lambada (SLSA motorglider) to production.” *** Jim also notes Phoenix Air S.R.O. and his Lee Aviation LLC, dba Phoenix Air USA, are completely different companies with no relationship to Urban Air. *** Also, I’d mentioned Evektor’s new direct-sale program, but Mr. Lee also noted that Evektor is still working out the details and may not do direct sale ops but some other program instead. *** I’ve got queries into the Czech company and will update once I hear. *** Thanks for the clarifications, Jim!